A central part of the Coming Together is to find and work with new ways of meeting our resources needs. This festival, like many marvelous happenings in the world of all the arts since time begun, only happens because numerous people give their time and art without monetary renumeration. At the same time they have to live, feed their families, get from A to B, etc etc. To honor and reward this we are developing a credit system where time and resource input freely given to the festival creation and running will be recorded and rewarded with a ccc, a unique community currency coin made out of paper. It's keeper has the right to exchange it for festival value, that is admission to ccc participating events, in proportion to her/his credit. This Coming Together Festivla rewards co-ownership, and explores best ways of doing so imaginatively and soundly. We are looking forward to work out the best ways with you. One element of co-ownership is to see and feel, and feel good about, the whole as it unfolds. We are transparently accountable to you. The festival material needs are limited, but our resources, as long as we are creating community currency, are unlimited. Some of the needs are covered by organisations giving in kind as part of their service and interest in the community. Some are covered by the £2000 Make a Splash funding from Voluntary Arts Scotland, under the conditions of the grant, which is to build and strengthen our Arts Community in the community volunteers, esp the young ones, and to bring and keep us all together, by making music, dance, do arts and crafts, and have fun in drama and creative writing and conversation! In short, by having us all come together in mutually supporting ways. we need to give the giver of the Yurt, the round space for our Circlings, the fuel and basic maintenance of the Yurt to be here with us. He translated those needs into a pound stirling figure, based on what our society lets the fuel etc transactions appear in current monetary currency, that is as £300. 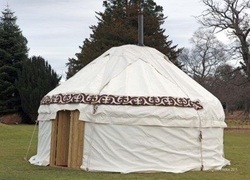 The 6 meter diameter Yurt with Kyrgystan Hangings, made by Paul from RedKiteYurts. Usual hire price: ca £2000. But, because we are working here with wellknown community currency practitioners, Paul and his Kyrgystan friend Shirin, we accepted his kind offer to host and guard the yurt for the 8 festival days and to return abundance with abundance. Which means: we trust YOU to experience the non-monetary value of this gift (a true community space) and - seeing the whole - create the pull to attract the needed monetary currency, too. As this gift came quite late - last minute really! - in the Preparation for Coming Together, AND as it prefectly reflected the underlying festival themes and workshops to do with "Wellbeing", " Calling the Circle" (workshop methodolgy for our creative writing circles on the the theme of "From Phantom Wealth to Real Wealth") we agreed to trust and put the ccc into existence and practise. to collect £300 current moneys worth as a minimum, and to reach beyond that, so that abundance is reached from which to give food and drink to the keepers, too. PS: you may give in £ or in food and drink! What do actually mean with 'Community Currency"? Has it got to do with anything one can google on 'community currency'? Is anyone masterminding this enterprise? No, what we mean with 'community currency' has nothing to do with what you can google anywhere. It has arisen by observing how people here (in Penicuik and District) identify and meet their needs for food of the whole human being. It uses very simple principles of exchange values, trust and accountability, and translates them into a finite project (this Coming Together Festival 2011) by allowing infinite possibilities to come together with the intent that everybody's needs will be met. There is no mastermind to this enterprise, albeit enterprising it is and it does rely on the experience and open mind of an increasing circle of individuals, which includes you, this very minute! To a certain extent it s an experiment, relying on your free spirit and ability to care, in a time were the phrase 'we have not the money' kills much caring and sharing. "From all the monetary systems mankind could have - today we have the worst possible!" Would you like all your needs met?